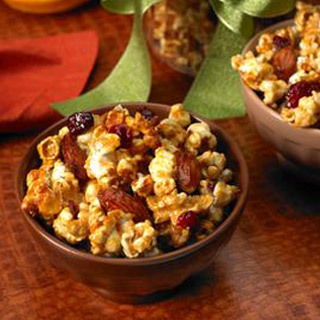 Use the fall-harvested cranberries in this delicious caramel corn recipe from The Popcorn Board. It is an addictive sweet treat you'll love having around, making any occasion festive. Preheat oven to 300 degrees. Place popcorn, cranberries and almonds in a large bowl; set aside. In a medium saucepan heat butter, brown sugar, corn syrup and orange juice concentrate over medium heat until butter is melted. Bring to a boil and boil 2 minutes. Remove from heat. Stir in extract and baking soda – the mixture will foam. Pour syrup mixture over popcorn mixture in bowl; stir to coat well. Spread evenly in a large, rimmed baking sheet or roasting pan, lined with foil and sprayed with nonstick spray. Bake 30 minutes, stirring twice during baking time, Stir caramel corn as it cools on baking sheet. Store in an airtight container.